Sunday sees the first of nine races for the Spring series. 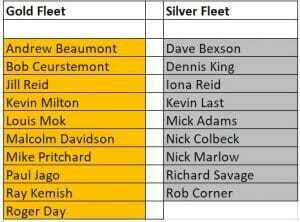 First race at 14:00hrs is for teh Gold, Silver and Bronze fleets. 2019 allocations are shown in the table. If not in Gold or Silver fleet then will race in Bronze fleet. As for previous seasons we will have 3 up, 3 down between fleets ready for next season. The second race at 16:00hrs is for the Fast and Slow fleets. Boats with PY handicaps up to and including 1080 are in the Fast fleet. Those greater than 1080 are in the Slow fleet. All PYs being the standard RYA ones.